In the old town a listed, restored farmhouse from the 14th century. Century is located on the 1st floor of a 140 square meter, comfortable and cozy apartment for up to 5 people. 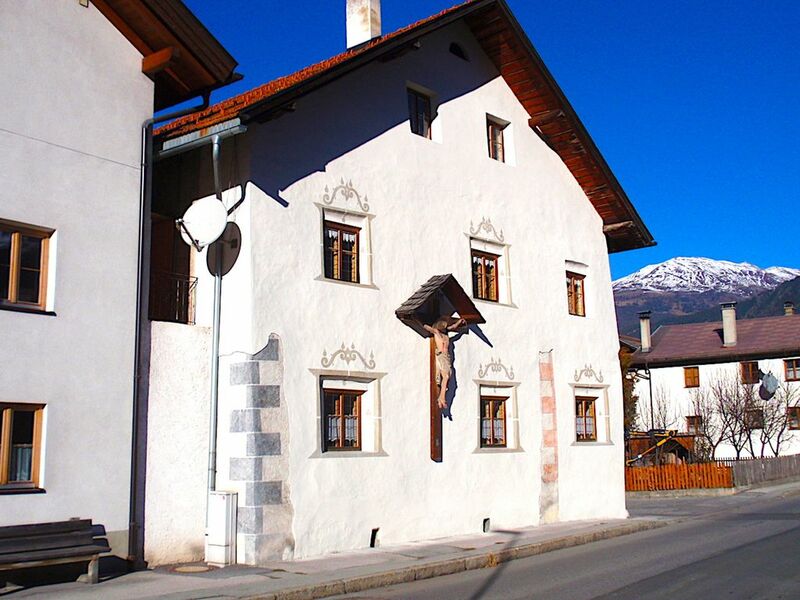 Enjoy your vacation in a comfortable accommodation with a large paneled room, spacious bedrooms and the special flair of the traditional and historic ambiance in a beautiful mountain landscape with many 3000m peaks. From here is an excellent starting point for mountain hikes, easy walks, mountain biking, tour biking and of course winter sports with all its facets. The many family-friendly ski areas Fendels, Serfaus-Fiss-Ladis, Venet, Kaunertal, Samnaun-Kappl-Ischgl u. A. Are in a short time with own vehicle, or to reach by bus. With ample ski facilities of downhill skiing, cross-country skiing, tobogganing, winter snowshoe everyone should get his money. For the needs of winter sports equipment, there are of course plenty of lending stations. After an eventful winter sports, hiking or a visit to one indoor pool with sauna in Feichten (Kaunertal), perhaps a welcome end to the day to let your mind wander. Shopping: In the village center there are bakers, butchers, restaurants, bank, Raiffeisen Bank. Food stores Hofer and MPREIS nearby. alles sehr sehr hübsch und liebevoll gemacht..
Wir waren mit fünf Erwachsen für eine Woche in dieser sehr geräumigen und geschmackvoll eingerichteten Wohnung. Es fehlten einige Kleinigkeiten. (goßer Topf, Schüssel), die uns aber direkt am nächsten Tag vom Verwalter gebracht wurden. Nach Fiss fährt man mit dem Auto ca. 15 Minuten, nach St. Anton eine halbe Stunde. Supermarkt (MPreis und Hofer) sind in der Nähe. Uns hat es an nichts gefehlt und wir kommen jederzeit gerne wieder! A big house with comfortable beds and a well equipped kitchen, spacious living, and a nice bathroom. Everything was new and well chosen. We received a warm welcome and felt very much at home.